The Fixed Depth Counting Chamber slides are designed for casa and reticule users to perform sperm counts in undiluted specimens. Each standard (3 x 1") chamber slide has a depth of 20 µm. This depth is optimal for sperm cells to form in a mono-layer so that movement is unencumbered, motility can be assessed and counts are made easily. Disposal of the entire apparatus eliminates manual cleaning and minimizes clinician exposure to body fluids. The Fixed Depth Counting Chamber slides have 4 chambers for 4 determinations. 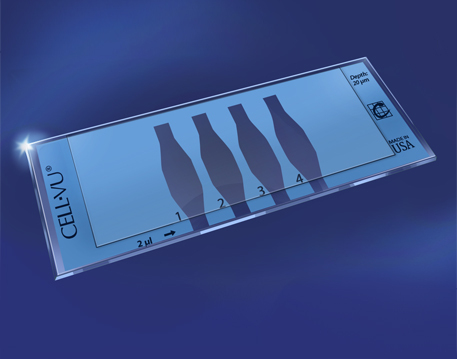 Click on an industry-leading distributor to purchase Cell-VU® Fixed Depth Counting Chamber Slides.